As mentioned, the included “Surveyor” editing module allows players to create, edit, and save both scenarios and entirely new routes. I created a few basic scenarios to explore the module, and was able to easily place trains car by car, exactly as I wanted. 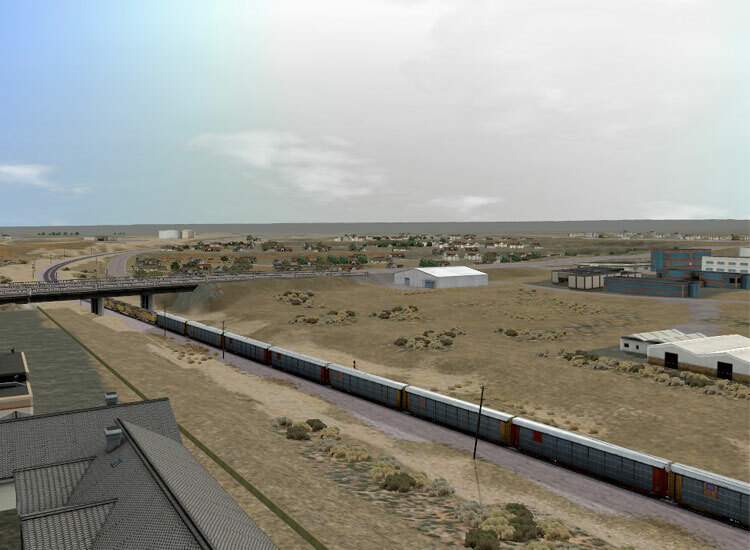 Building a few consists along the sidings of a route, then dropping a few different locomotives (which were just as easily placed as rolling stock, unlike the “Quickdrive” mode), I was able to create some basic yet enjoyable scenarios that let me choose different locomotives and consists and drive them as I wished. Additional variety is offered in that scenarios can easily be created at different times of day just by setting the clock. Scenery objects will automatically illuminate their lights as dark approaches. Having some fun with the Surveyor module. The route editor actually allows the player to construct every part of the terrain, place scenery objects, track, and pretty much everything else imaginable. I experimented with shaping the terrain on a few existing routes, and the process was easy to jump into. 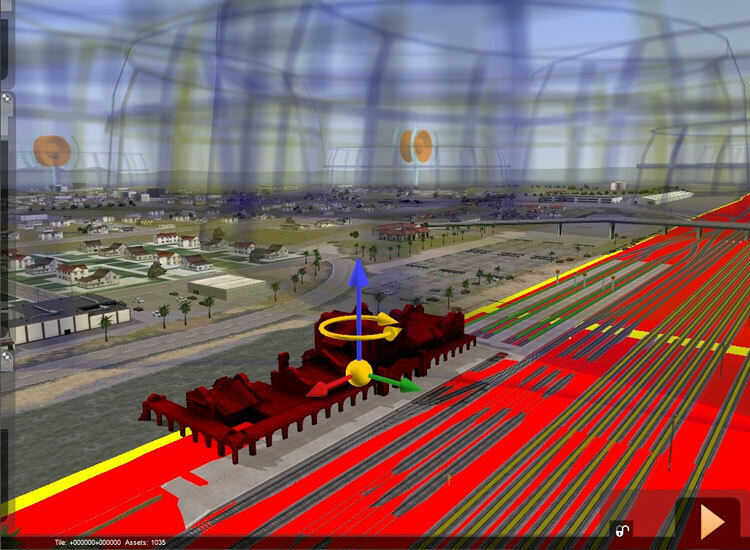 Variable brush sizes and strengths are used to shape terrain and paint textures directly within the main 3D world view, and the results appear in real time while working. Along the upper right hand side of the GUI are a series of tabs which open to offer various tools and assets for editing. These are quite easy to grasp even without spending much time in the manual. 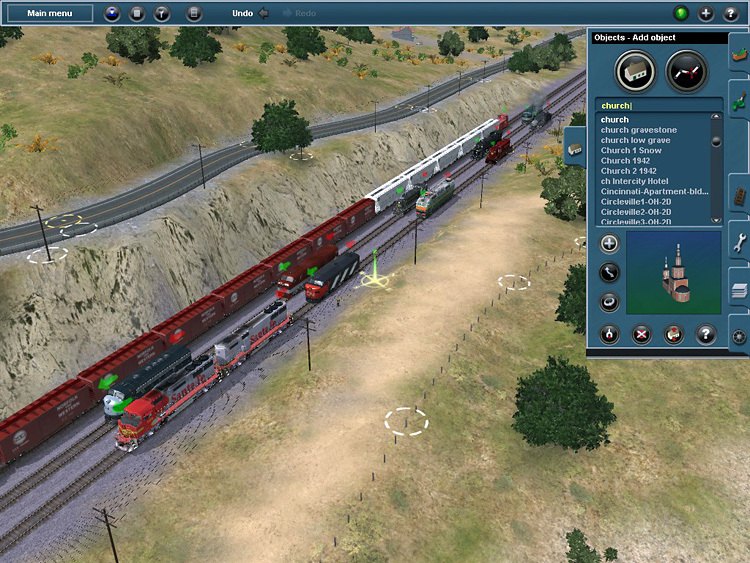 Many buildings, vehicles, foliage, and other items are easily placed, scaled, rotated, and moved exactly as desired. All of the effort invested here can of course be saved as completely new routes for working on them later and driving them, after populating them with trains. The time to save a scenario or route did seem a bit long, sometimes a couple of minutes, though there were a massive number of objects in the scene. The instruction manual devotes considerable space to the “Surveyor” module, and there is more depth here than I could absorb during the span of time invested for this review. Even with my novice skill, I was still impressed with my time using the “Surveyor” module. It was much the same as sitting and working on an actual model railroad layout, indeed even easier when it comes to sculpting and texturing the terrain. 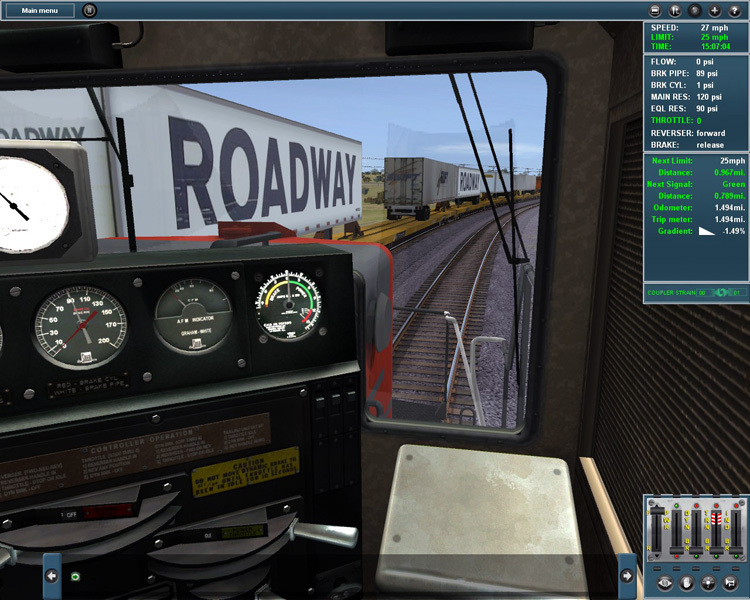 Trainz Simulator 12 offers a full featured package for players interested in both driving trains, as well as building new routes. The content with my review sample included 9 routes and a massive collection of locomotives and rolling stock, plus scenery for editing and building routes. A couple of the included routes are smaller, and there is some content that is of notably lower visual quality in comparison to the rest. 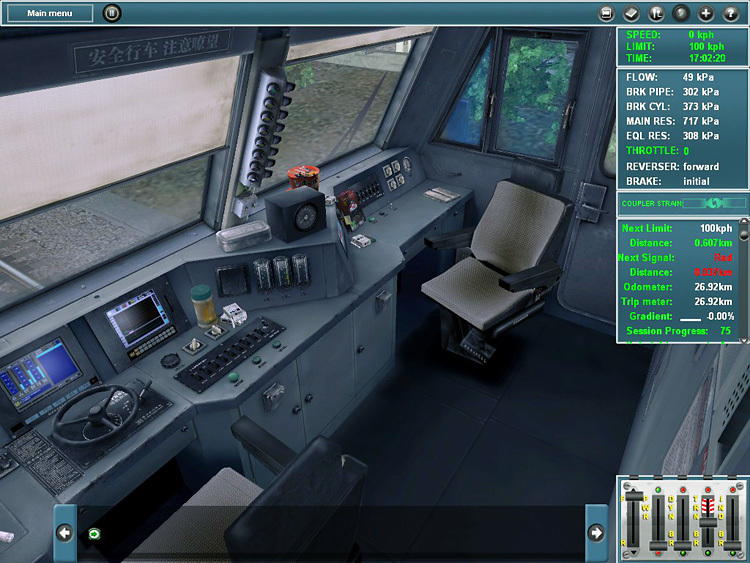 The included scenarios and tutorials are well done and offer a good variety, though having a few more per route would be good for a new player who is not yet up to speed on creating new scenarios themselves. The multiplayer options are a nice touch for those looking for a more dynamic simulation environment, though I would have liked to see some of the included routes and scenarios preconfigured for multiplayer. 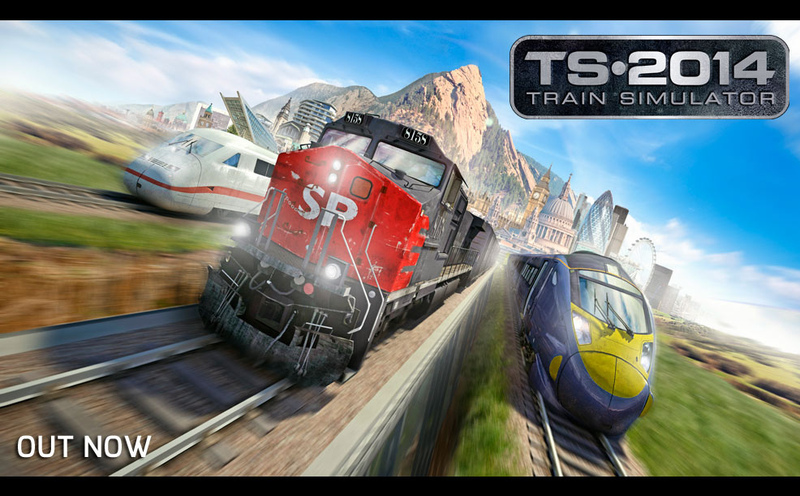 Overall, the wide range of included content and the enjoyable train simulation itself make for a strong showing. Additional downloadable content and multiplayer options offer extended variety. Those wanting to enjoy a more casual experience similar to model railroading will find an approachable and varied product, though a dozen or so more scenarios would be welcome. Players interested in the more in-depth aspects of the simulation and route building should find a good value here. A broad selection of included content with more available for download. Easy to pick up and play, options for novice and more advanced players. Lots of easy to use views while driving. Some included content is lower quality. More scenarios would be welcome. Map could use some large labels for towns and objectives.